A comedy presented in the tradition of Irish storytelling opens for seven performances as the Illinois Central College Theatre Program presents The Cripple of Inishmaan in the studio theatre of the ICC Performing Arts Center, located on the East Peoria Campus. 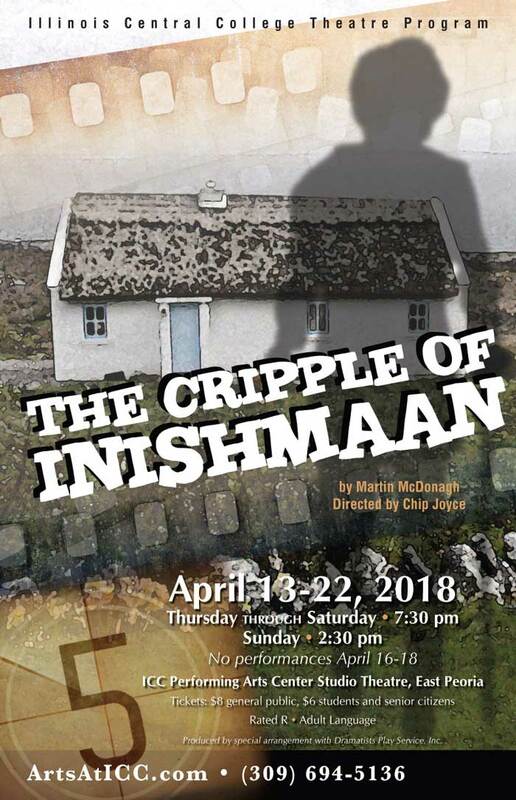 Set on a remote island off the west coast of Ireland in 1934, The Cripple of Inishmaan is a strange and offbeat comedic tale in the great tradition of Irish storytelling. As word arrives on Inishmaan that Hollywood director Robert Flaherty is coming to the neighboring island of Inishmore to film Man of Aran, the one person who wants to be in the film more than anybody is young Billy, if only to break away from the bitter tedium of his daily life. A truly brilliant and funny evening of theatre. The seven performances take place over two weekends between April 13 and April 22. Thursday through Saturday shows begin at 7:30 pm, and Sunday performances start at 2:30 pm. There are no performances April 16-18. The run of the show coincides with Arts Week 2018 at ICC, a week of concerts, events and exhibits from April 16 through April 20 on the East Peoria Campus. Arts Week showcases and celebrates for the public the diversity of arts at Illinois Central College. For a full schedule of events, visit ArtsAtICC.com/ArtsWeek. The Cripple of Inishmaan is rated R for adult language. Cast members, their hometowns and roles include: Frank Drew of Peoria as Johnnypateenmike; Josh Graff, Manito, Billy; Cindy Hoey, Peoria, Mammy; Alexandra Jorgenson, Peoria, Eileen; Noah Lane, Farmington, Doctor McSharry; Elizabeth Lape, Roanoke, Helen; Kathleen McCarty, Peoria, Kate; Dalton Sander, LaFayette, Babbybobby; and Kyle Tam, Washington, Bartley. The play was written by Martin McDonagh and is produced by special arrangement with Dramatists Play Service, Inc. Chip Joyce directs the ICC production.